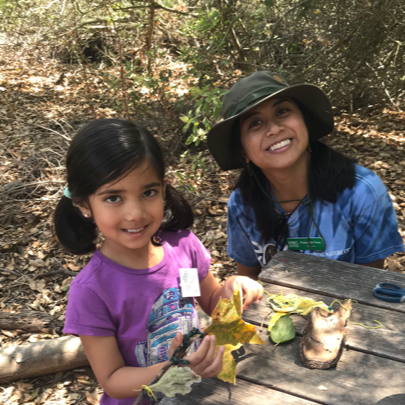 Home / Nature Camp / Learning and Being Creative at ENC Nature Adventure Camp! Learning and Being Creative at ENC Nature Adventure Camp! After break time, the explorers and ENC Naturalists split apart to explore the trails. Michelle Price is one of our naturalists leading the camp for the first time. Price was as excited as her students were as she head deeper into the trail. A curious student picked up a feather on the trail, “filoplume,” Price exclaimed. Price took the feather and showed it to her class, “filoplume, my favorite word!” After a quick history lesson on Thomas Jefferson and his personal flock of geese that he used to extract writing quills from, Price moved on to plant structure. Meanwhile, Kelly Rush, also a first time ENC naturalist, took her students deep into the Redwood corner of the trails. 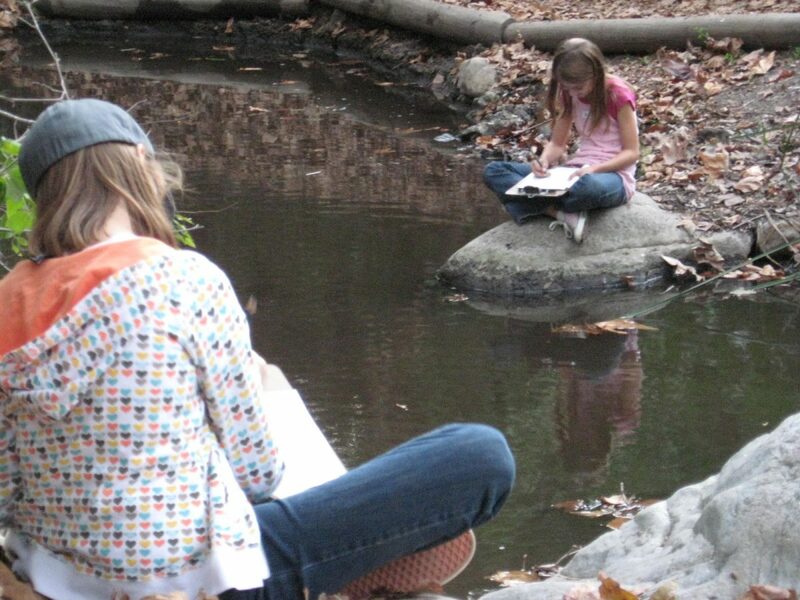 With a few younger explorers, today’s lesson was all about making a nature journal. One student, Harold, had a wild imagination and entertained our camp with his many stories while everyone was hard at work on their nature journals. For some, that meant drawing trees while others opted for colorful rainbows. In a sunny patch on the trail, I came across Penny De Vera, an ENC Naturalist that had also participated in our Spring camps. Here, she had her students making Nature Wind Catchers. Paints, yarn and leaves decorated the table as her students let their mind run wild, each creating a uniquely different wind catcher. De Vera helped the students tie together an array of leaves to different sticks while her Leaders in Training helped the students pick what paints they wanted to decorate them with. At the end of the lesson, everyone’s hands were just as decorative as the catchers they made! Hiking back to the picnic table where Price was teaching us about plants, we learned about different types of roots and the function of each part of a plant before getting to leaf pressing. Here, students took leaves, pressed them between a paper and a clipboard and colored on top of them to create colorful plant mosaics on their papers. Price followed the beautiful artwork with a lesson in making lanyards, a classic souvenir after a hard day’s work of learning and exploring. 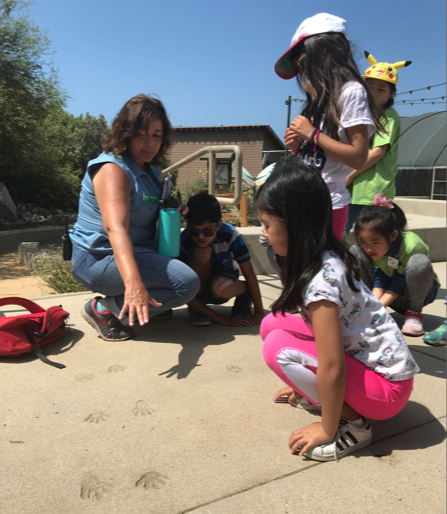 Nature Adventure Camps will continue throughout the Summer with different themes each week and there are still spots available to sign up! To learn more about all of our camps and activities, visit encenter.org.